I received the watch, and opened the package to inspect it as it was a Christmas present for a family member. The watch is very shiny and sparkly. It looks like I paid much more than I what I did, and seems to be a sturdy watch, although time will tell once the gift getter wears it for a while. Get this watch if you want to be noticed, and the best part is that it's pretty inexpensive which is a total plus. This Akribos XXIV luxury diamond leather band women's watch from the Akribos Brillianaire Collection combines the sizzle of diamonds and the sleekness of a fine casual dress watch. The Gold Brilliance is powered by a fine Swiss quartz movement. The way the picture looks, and from the description, "Diamond Gold Brilliance" makes it seem like the sparkle around and on the watch would at least be rhinestones. Upon receiving the watch I learned that the outer edge was just silver paint, cut to add sparkle. No rocks. The watch only shines when directly in the sunlight and the silver paint around the edge cheapens it dramatically. Should not have expected much from an $$$ watch. I don't know much about the brand but potentially a knock off since the attached price tag said $495? No one in their right mind would pay that much for the watch I received. Other then the issue with outer edge watch is cute though, so buy if you don't mind it looking cheaper then product shown. This watch looks great on my wrist. I was hoping the face would not be too small, as it is sometimes hard to tell when the watch is not pictured being worn, but the size was perfect. It looks elegant. I am constantly thrilled when people remark how expensive my watch must be I have heard people say they wish they could afford such a beautiful diamond watch. I love it! Great Summer watch. Really cute. Was a nice watch, a bit larger than I expected but still really like it. Love the diamond face. Very good value for this watch as it looks more expensive than it actually cost. Good looking time-piece but not very durable. After a while one of the hands stopped turning, and the watch stopped working. Not sure why the original "price" was so high. The watch was damaged and it looked nothing like the picture on the website. "Does this watch need batteries?" Yes, but it comes with batteries. 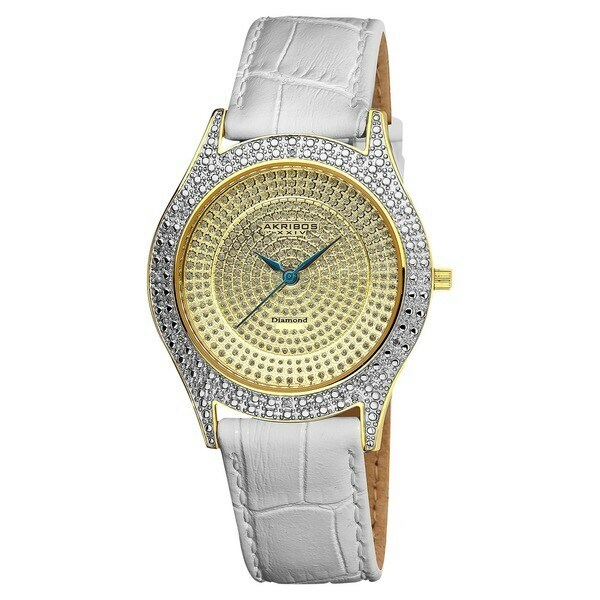 This watch contains 12 genuine clear diamonds at the hour positions.